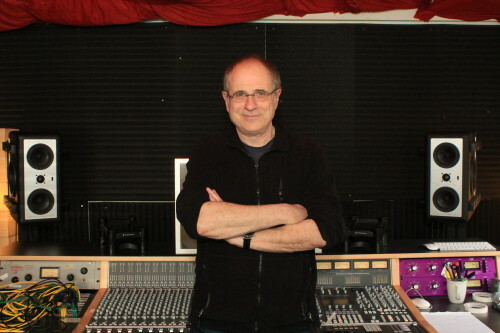 Pictured in his Nashville studio is producer Bob Ezrin with his Barefoot Sound MM27 monitors. Nashville, TN, March, 2014 — Top producer Bob Ezrin installed Barefoot Sound MM27 monitors when he moved into his Nashville studio in the famed Berry Hill neighborhood of Music City USA. His spacious control room houses an AWS console, an abundance of vintage outboard gear, numerous keyboards, and more than 40 guitars. Ezrin first encountered the Barefoot monitors during a demo at Electric Lady Studios in NYC. The choice of music to listen to was Pink Floyd’s “The Wall,” which he co-produced. In an illustrious career as a music and entertainment producer that has spanned over 40 years, Toronto-born Royal Conservatory alumnus Bob Ezrin has worked in virtually all genres and media with many of the world’s most celebrated contemporary artists, including, Pink Floyd, Alice Cooper, U2, Peter Gabriel, Deep Purple, Lang Lang, Jay-Z, Taylor Swift, K’naan, will.i.am, Zucchero, Green Day, Elton John, Lou Reed, Rod Stewart and many others. The new Barefoot Sound MicroMain27 Gen2 is a 3.5-way active system with 5 drive units housed in sealed enclosures spanning 30Hz to 45kHz with vanishingly low distortion, big dynamic range and ultra-fast transient response. The ring radiator tweeter is superbly detailed and produces very wide dispersion out to its highest frequencies. The new 5.25″ midbass features a phalanx of advanced technology, yielding midrange detail that rivals any driver available. Ezrin has produced numerous major events including the re-opening of the SuperDome after Katrina and Pete Seeger’s 90th Birthday Concert at Madison Square Garden. Among numerous film and TV projects, Ezrin produced the award winning film “Fade To Black” starring Jay-Z, Beyonce and a wide variety of urban artists. His monitors must perform with a vast variety of musical sounds. instruments lost in natural disasters. He is also a past trustee and governor of The Recording Academy.